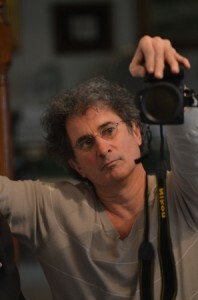 June 7, 2012 – CHICAGO -– Brilliant litigation attorney Bradley Weiss, stricken with Parkinson’s Disease at the height of his Washington, DC career working with the Department of Justice, FBI and more, and as Of Counsel at Chicago’s prestigious law firm, Miner, BarnHill & Galland, turns professional artistic photojournalist with the debut of his photo series Montezuma Nights at Chicago’s Mars Gallery, opening Thursday evening June 7, 2012, 1139 W. Fulton Market. Curated by renownedcurator and photographer Susan Aurinko. Opening night reception is being sponsored by a collaboration of the many different connections in Bradley’s life including his former Chicago law firm Miner, Barnhill & Galland and Highland Park restaurant 2nd Street Bistro with live music by The Side Cars. Thanks to a risky surgery called DBS (deep brain stimulation last December) Bradley’s Parkinson’s has slowed down and according to him, he is almost back to his old self! To honor the Rush University Medical Center doctors who gave Bradley his life back, a portion of art proceeds opening night will benefit The Parkinson’s Disease & Movement Disorder Program at Rush University Medical Center (Rush) as a deep hearted thank you. Opening Reception of Montezuma Nights – A Photographic Exhibition by Bradley Weiss, curated by Susan Aurinko. Runs thru June 21st. Portion of art proceeds benefits Parkinson’s disease. A portion of art proceeds opening night will benefit The Parkinson’s Disease & Movement Disorder Program at Rush University MedicalCenter as a deep hearted thank you to the doctors that gave Bradley his life back! Photo Opportunities: Bradley Weiss, his children Jack (17) & Leah (13), the doctors from The Parkinson’s Disease & Movement Disorder Program at Rush, Miner, BarnHill & Galland partner Judson Miner.